Roger Staubach was born in Cincinnati, Ohio, the son of Elizabeth (née Smyth) and Robert Staubach. Staubach is of partial German descent. He grew up in Silverton, a northeastern suburb of Cincinnati. Roger was an only child. He was also a Boy Scout as a youth. Roger attended St. John the Evangelist Catholic School and graduated from the Catholic high school Purcell High School in Cincinnati (now named Purcell Marian High School) in 1960. After one year at New Mexico Military Institute in Roswell, Staubach entered the U.S. Naval Academy in 1961 and played quarterback for the Midshipmen. As a third-class midshipman (sophomore) in 1962, he got his first opportunity to play in the third game of the season, against the University of Minnesota on October 6. He relieved starter Ron Klemick as the Minnesota defense, led by Bobby Bell and Carl Eller, was stifling in its 21–0 victory. Staubach was 0–2 passing and was sacked twice for -24 yards. A week later, playing against Cornell University, with the offense failing, Hall of Fame coach Wayne Hardin decided to put Staubach into the game to see if he could improve the team's offense. He led Navy to six touchdowns, throwing for 99 yards and two touchdowns while running for 88 yards and another score as Navy won 41–0. A few weeks later, Staubach started again in the famous Army–Navy game. John F. Kennedy (himself a former naval officer), who just 37 days earlier had negotiated the end of the Cuban Missile Crisis, attended the game, performing the coin toss. Staubach led the team to a 34–14 upset over Army, throwing for two touchdowns and running for another. In his second class (junior) season of 1963, he won the Heisman Trophy, Maxwell Award, and the Walter Camp Memorial Trophy while leading the Midshipmen to a 9–1 regular season record and a final ranking of No. 2 in the nation. He appeared on the cover of Time in October; he would also have been on the cover of Life magazine's November 29, 1963 issue, but for the assassination of President Kennedy. On New Year's Day, the Midshipmen lost the national championship to the No. 1 team, the University of Texas, in the 1964 Cotton Bowl. Earlier that season, Staubach led Navy to a 35–14 road victory in its annual rivalry with Notre Dame. Navy did not beat Notre Dame again until 2007, 44 years later. During three seasons at Navy, Staubach completed 292 of 463 passes with 18 touchdowns and 19 interceptions, while gaining a school record 4,253 yards of total offense. Staubach is the last player from a military academy to win the Heisman Trophy. As a senior in 1964, he injured his left heel in the opening game victory over Penn State and missed the next four games, and Navy finished the season at 3–6–1. The Naval Academy retired Staubach's jersey number (12) during his graduation ceremony after his senior season. In 1981 Staubach was enshrined in the College Football Hall of Fame. In 2007 Staubach was ranked No. 9 on ESPN's Top 25 Players In College Football History list. His collegiate football career completed, Staubach closed out his Academy sports career as captain of the Academy's 1965 baseball team. During his junior year at the Naval Academy, Staubach's color-blindness was detected and he was commissioned directly into the Supply Corps, which did not necessitate being able to tell the difference between red (port) and green (starboard) lights or to discern the color differences in electrical circuitry. After graduating from the Naval Academy in June 1965, Staubach could have requested an assignment in the United States, but he chose to volunteer for a one-year tour of duty in Vietnam. He served as a Supply Corps officer for the Navy at the Chu Lai base/port (a secondary air base providing relief for Da Nang Air Base approximately 50 miles (80 km) to the northwest) until 1967. Staubach supervised 41 enlisted men. Staubach returned from Vietnam in September 1967, and spent the rest of his naval career in the United States. He played football on various service teams to prepare for his future career in the National Football League. Staubach was a 10th-round future draft choice in the 1964 NFL draft by the Dallas Cowboys. The National Football League allowed the Cowboys to draft him one year before his college eligibility was over, although due to his four-year military commitment, he would not begin playing professionally until 1969 as a 27-year-old rookie. He was also drafted by the Kansas City Chiefs in the 16th round (122nd choice overall) of the 1964 American Football League Draft, also with a future selection. While still in the Navy during 1968, he went to the Cowboys rookie camp, using most of his annual military leave. During 1969, Staubach resigned his naval commission just in time to join the Cowboys training camp. The Cowboys won the first NFC title in 1970 with Craig Morton starting at quarterback, but lost to the Baltimore Colts in Super Bowl V, losing by three points on a last-second field goal. 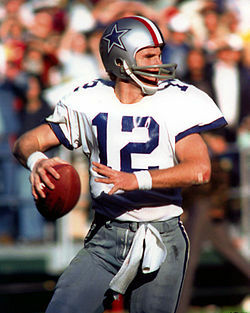 In 1971, Morton began the season as the starter, but after a loss to the New Orleans Saints, Staubach assumed the role. However, in a game against the Chicago Bears during the seventh week of that season, coach Tom Landry alternated Staubach and Morton on each play, sending in the quarterbacks with the play call from the sideline. Dallas gained almost 500 yards of offense but committed seven turnovers that resulted in a 23–19 loss to a mediocre Bears squad that dropped the Cowboys to 4–3 for the season, two games behind the Washington Redskins in the NFC East race. Staubach assumed the full-time quarterbacking duties in a week-eight victory over the St. Louis Cardinals and led the Cowboys to 10 consecutive victories, including their first Super Bowl victory, 24–3 over the Miami Dolphins in Super Bowl VI in January 1972. He was named the game's MVP, completing 12 out of 19 passes for 119 yards and two touchdowns and rushing for 18 yards. In 1972, Staubach missed most of the season with a separated shoulder, but he relieved Morton in a divisional playoff against the San Francisco 49ers and threw two touchdown passes in the last 90 seconds to win the game 30–28. With that performance, he won back his regular job and did not relinquish it again during his career. Staubach led the Cowboys to a second Super Bowl win in the 1977 season. He threw for 183 yards and a touchdown, with no interceptions, in Dallas' 27–10 victory in Super Bowl XII over the Denver Broncos. Staubach also led the Cowboys to Super Bowl appearances in Super Bowl X and Super Bowl XIII, where they lost to the Pittsburgh Steelers both times by a total of eight points. Staubach's offensive teammates included standout receivers "Bullet" Bob Hayes, Lance Alworth, Drew Pearson and Golden Richards, tight ends Mike Ditka, Billy Joe Dupree and Jackie Smith, tackle Rayfield Wright and running backs Robert Newhouse, Calvin Hill and Tony Dorsett. Dorsett, Hayes and Wright are in the Hall of Fame, as are Alworth, Ditka and Smith (although those three were all with the Cowboys only at the end of their careers). In his final NFL season of 1979, Staubach scored career highs in completions (267), passing yards (3,586) and touchdown passes (27), with just 11 interceptions. He retired at the conclusion of the season in order to protect his long-term health, declining the Cowboys' offer for two more seasons. He suffered 20 concussions in his playing career, including six in which he said he was "knocked out". After suffering two concussions in 1979, a doctor at Cornell told Staubach that while his brain tests were fine at the moment, another concussion could have life-altering consequences. He was succeeded as the Cowboys starting quarterback by Danny White. Overall, Staubach finished his 11 NFL seasons with 1,685 completions for 22,700 yards and 153 touchdowns, with 109 interceptions. He also gained 2,264 rushing yards and scored 21 touchdowns on 410 carries. For regular-season games, he had a .750 winning percentage. Staubach recorded the highest passer rating in the NFL in four seasons (1971, 1973, 1978, 1979) and led the league with 23 touchdown passes in 1973. He was an All-NFC choice five times and selected to play in six Pro Bowls (1971, 1975–1979). President Trump presents the Medal of Freedom to Roger Staubach in 2018. Staubach retired from football in March 1980 as the second-highest-rated passer of all time at 83.4 (behind Otto Graham at 86.6), and was voted into the Pro Football Hall of Fame in 1985. In 1999, he was ranked No. 29 on The Sporting News list of the 100 Greatest Football Players, the second-ranked Cowboy behind Bob Lilly. Staubach was one of the most famous NFL players of the 1970s. Known as "Roger The Dodger" for his scrambling abilities, "Captain America" as quarterback of America's Team, and also as "Captain Comeback" for his fourth quarter game-winning heroics, Staubach had a penchant for leading scoring drives which gave the Cowboys improbable victories. He led the Cowboys to 23 game-winning drives (15 comebacks) during the fourth quarter, with 17 of those in the final two minutes or in overtime. Perhaps Staubach's most famous moment was the "Hail Mary pass" in the 1975 playoff game against the Minnesota Vikings. With seconds on the clock and the Cowboys trailing 14–10, Staubach launched a 50-yard bomb to wide receiver Drew Pearson, who caught the pass and strode into the end zone for a 17–14 victory. After the game, Staubach said he threw the ball and said a "Hail Mary". Since then, any last-second pass to the end zone in a desperate attempt to score a game-winning or tying touchdown is referred to as a "Hail Mary" pass. Staubach was named The Walter Camp "Man of the Year" in 1983, and was awarded the Davey O'Brien Legends Award in 2001. In 1996, the U.S. Navy Memorial Foundation awarded Staubach its Lone Sailor Award for his naval service. On the occasion of the 30th anniversary of Super Bowl VI in 2002, Staubach, accompanied by former President George H.W. Bush, flipped the coin at Super Bowl XXXVI, played at the Louisiana Superdome, where his only other Super Bowl victory took place. On January 25, 2007, Staubach was named chairman of the North Texas Super Bowl XLV Bid Committee, whose goal was to have the Dallas-Fort Worth Metroplex host the Super Bowl in 2011. On May 23, 2007, the NFL chose Dallas as the host city of Super Bowl XLV. In 2010, Staubach was named the No. 1 Dallas Cowboy of all time according to a poll conducted by the Dallas Morning News. In November 2018 he was awarded the Presidential Medal of Freedom. In 1977, he started a commercial real estate business, The Staubach Company, in partnership with Robert Holloway Jr., an associate of Henry S. Miller. He had prepared by working in the off-seasons from 1970 until 1977 for the Henry S. Miller Company. Staubach began working with real estate because "I couldn’t have retired at my age and just played golf. First of all, they didn’t pay quarterbacks what they do today. And I was 27 with three kids. I kept thinking about [what would happen] if some linebacker takes off my head and I can’t play anymore." He said "Henry Miller Jr. was a lot like [legendary Cowboys coach Tom] Landry. They both had similar haircuts ... they both had phenomenal integrity, great work ethic, and they could transfer their strengths to other people." The Staubach Company has been his primary endeavor since retirement from football. The company first developed several office buildings; Holloway managed construction while Staubach found tenants. In 1982, Staubach bought out Holloway and shifted the company's emphasis from commercial development to representing corporate clients seeking to lease or buy space. This proved fortuitous as a boom in Dallas office construction followed by a recession in the Texas oil industry left the city with excess office space, so companies representing tenants wielded greater influence. The company has worked with major businesses including AT&T, McDonald's Corporation, Hospital Corporation of America and K Mart Corporation. The company was also involved with residential development, with ownership stakes in 27 apartments and other real estate projects in the Dallas-Fort Worth area. Some of these were in partnership with Cowboys teammate Bob Breunig through S.B.C. Development Corporation, then a subsidiary of the Staubach Company. Others were collaborations with local developers and investors, including Ross Perot. He served as its chairman and CEO until June 20, 2007, when he announced he would resign as CEO of the multibillion-dollar real estate company he started 30 years earlier. On July 11, 2008, The Staubach Company was sold to Jones Lang LaSalle for $613 million. Staubach and his children's trust would gross more than $100 million from the sale by 2013. The sale provided an initial payment of $9.27 per Staubach share with additional payments due during the ensuing five years for a total of approximately $29/share. Staubach took half of his first payment in Jones Lang LaSalle stock which was then trading at approximately $59.50/share. Staubach currently serves as executive chairman of Jones Lang LaSalle. On December 27, 2011, Staubach wrote the foreword for a book titled The Power in a Link, published by John Wiley & Sons, authored by United States Military Academy graduate, David Gowel. During the 1970s and early 1980s, he was a spokesperson for the men's clothing retailer Anderson Little, appearing in both print and television advertisements. Later, he did television advertisements for Rolaids as well. During the early 1980s, Staubach worked for a brief time as a color commentator for CBS Sports' NFL telecasts. On November 9, 1980, during a close game between the New York Giants and the Dallas Cowboys, Staubach broadcast a nostalgic comment by exclaiming he would like to be "right down there in the middle of it". The Cowboys lost 38–35. Staubach jointly owned Hall of Fame Racing, a NASCAR Nextel Cup Series team, with fellow former Cowboy and hall-of-famer Troy Aikman, which began racing for the 2006 season. In 2009, Staubach was honored with the "Lombardi Award of Excellence" from the Vince Lombardi Cancer Foundation. The award was created to honor coach Lombardi's legacy, and is awarded annually to an individual who exemplifies the "spirit" of the coach. On September 25, 2007, a fundraising email was sent out from the presidential campaign of Senator John McCain (R-AZ) with a letter from Roger Staubach asking recipients to make a contribution before the Federal Election Commission third-quarter reporting date of September 30, 2007. Staubach is a conservative Republican who has often been mentioned as a possible candidate for political office and had once been asked to campaign for U.S. Senator. He received a single vote for Vice Presidential nomination at the 1976 Republican National Convention. In 2013, Staubach's daughter, Jennifer Staubach Gates, won a city council seat, representing Dallas, Texas 13th District. ^ "Game in the Shadows". Retrieved February 19, 2016. ^ a b c "Breakfast With: Roger Staubach". Retrieved November 20, 2018. ^ "Staubach, Roger - Encyclopedia.com". www.encyclopedia.com. Retrieved November 20, 2018. ^ Inc, Boy Scouts of America (November 1, 1977). Boys' Life. Boy Scouts of America, Inc.
^ Inc, Boy Scouts of America (November 1, 1963). Boys' Life. Boy Scouts of America, Inc.
^ "Navy Historical Scores". Jhowell.net. Retrieved November 28, 2008. ^ "All NACDA Members Opening Remarks and Keynote Address". Nacda.com. Retrieved December 15, 2013. ^ Kelly, John (November 20, 2013). "Near the anniversary of JFK's death, the most famous magazine cover that never was". The Washington Post. Retrieved November 12, 2018. ^ "Roger Staubach's recalled LIFE Magazine cover". CBSSports.com. Retrieved November 12, 2018. ^ "Staubach, Navy rip Notre Dame". Tuscaloosa News. Alabama. Associated Press. November 3, 1963. p. 14. ^ "Irish fear Navy with Staubach". Milwaukee Sentinel. Associated Press. October 30, 1964. p. 5, part 2. ^ The Nineteen Hundred and Sixty Five Lucky Bag. Annapolis, Maryland: United States Naval Academy. p. 391. ^ "A Do-gooder Who's Doing Good". CNN. September 4, 1978. ^ "Navy's top prizes go to Staubach". Reading Eagle. Pennsylvania. Associated Press. June 6, 1965. p. 54. ^ "Staubach misses football, feels he'd click as pro". Retrieved February 19, 2016. ^ a b Richman, Milton (July 27, 1968). "Staubach pleases coach in Cowboys' workouts". The Dispatch. Lexington, North Carolina. UPI. p. 9. ^ "Navy's Roger Staubach Signs Dallas Contract But Must Wait 4 Years". Retrieved February 19, 2016. ^ a b "1964 AFL Draft Listing - Pro-Football-Reference.com". Pro-Football-Reference.com. Retrieved November 20, 2018. ^ Jones, Lindsay H. (August 29, 2013). "Despite 20 concussions, Roger Staubach stayed out of lawsuit". USA Today. ^ "The Great White Hope". CNN. August 18, 1980. ^ "Cowboys work miracle play". Victoria Advocate. Texas. Associated Press. December 29, 1975. p. 1B. ^ Moore, Dave (January 25, 2007). "Staubach to lead Dallas Super Bowl bid". Dallas Business Journal. Retrieved February 21, 2007. ^ "Babe Ruth, Roger Staubach, Alan Page to receive Presidential Medal of Freedom". ESPN. November 10, 2018. Retrieved November 16, 2018. ^ a b Bancroft, Bill (June 11, 1989). "A Texas Power Play". The New York Times. ^ "Jones Lang LaSalle to Buy Staubach for $613 million". Bloomberg.com. June 16, 2008. Retrieved November 28, 2008. ^ "The Power in a Link: Open Doors, Close Deals, and Change the Way you do Business Using LinkedIn". Amazon.com. December 27, 2011. Retrieved December 30, 2011. ^ "Staubach's Daughter Wins Dallas Council Seat". Newsmax.com. May 13, 2013. Retrieved November 13, 2013.